Dedicated to emotion, mind, and science as a tool for performance. 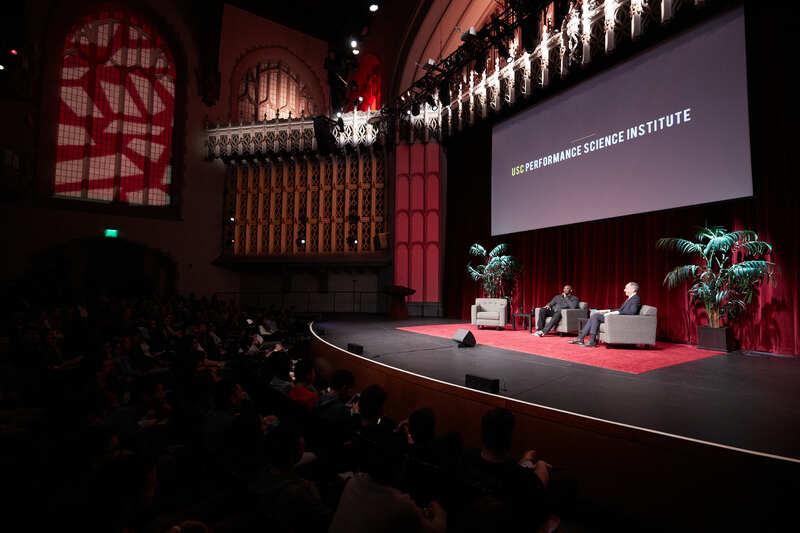 Kobe Bryant speaks with the USC Performance Science Institute's David Belasco about competition, career, and coaching. What holds you back in life — your skill set? Or your mindset? A robust skill set is obviously vital, but skills have a shelf life: software becomes obsolete, factories re-tool, and businesses pivot. In each case and career, those with the ability to handle transition, re-orient toward deeper purpose and elevate others in the process will outperform those who remain mired in old habits and frameworks. In plain terms, the perspective that this section of Thrive Global holds is that mindset — that is, the way we frame, feel, and tell stories about our perception is the key element to living a happy life. One’s mindset provides an ability to transition, engage, and elevate. To thrive, is thus built on the relationship of our mind and body to the external world. Fortunately, with practice we can adjust our mindset and emotions, and enjoy the performance benefits that a skillful mind manifests. With that as backdrop, welcome to the USC Performance Science and Thrive Global collaboration. The purpose of this section of Thrive Global is to explore aspects of performance and mind. But more importantly, here we seek to be curious, to train, and to evict the elements of mind that do not elevate and connect us with our broader human dignity. The USC Performance Science Institute, housed at the USC Marshall School of Business, is dedicated to training the mind for high performance in any domain. Mindset has to be connected to results, not merely wellness. Performance is a universal need — it encompasses the acts of heroics on stages and fields, as well as boardrooms, classrooms and living rooms. In particular, we focus on high performance in the maintenance of key social relationships, and in particular that which is done in service of others. Our founders include luminaries, high performers, creative iconoclasts, and of course, scientists focused on mind, health and meaning. Our approach is distinctive: we couple the modern science of high performance and virtue with holistic and historical perspectives on key human themes. The goal of our writing is that our readers gain an advantage in their performance as it is based in sound science. We will discuss the science of gratitude, grit, habit, resilience, and describe how it works in the brain and body. We will cover the basics — the neuroscience of emotion, psychological constructs like authenticity and purpose, and findings from our own research. We will also take no prisoners in debunking myths related to performance that are harmful or not based in sound rigorous science (yes, I can’t believe I need to say it: you use all 100%, not 10%, of your brain, and no, dopamine is not the “pleasure” drug). Finally, we will bring in our friends and people we admire as they do amazing things and we learn from their examples and connect them to the science of performance with the goal of transferring their approaches into our everyday experiences. The USC Performance Science Institute was founded to serve those who wish to understand and apply the science of performance in any domain. Our institute founders involves some names you may have heard of: Pete Carroll, Michael Gervais, David Belasco, and some we can’t wait to introduce you to, like Robin Scholefield and Haley Barrows. Our institute hosts luminaries and speakers from the world over and we will feature our takeaways and content from those talks here. In the past few years we’ve hosted Brene Brown, Alex Honnold, Kobe Bryant, Mark Cuban, Jessica Alba, and of course Thrive Global’s own Arianna Huffington. We’ve learned so much from these individuals, and we are excited to share from wherever the lights are bright. We aim to give readers a unique perspective on science and its processes, and help give context and curation for interpreting science. We aim to redefine how we think about emotion and performance, and develop a mindset that will help us create and live joyfully without reservation or limit. We all have a need to perform, whether it is in high-pressure situations, careers, or interpersonal relationships. Up to now, strategies and tactics to meet this need – particularly in terms of our daily habits and disciplines – were left to intuition and non-repeatable methods. Today, research is developing rigorously tested methods for improving performance in any domain, and we are beginning to quantify the physiological states that are associated with performance. We believe the same skills that elite trainers and coaches use to train mindset can help people pursue bigger goals and maintain key relationships. Drowning in Life Hacks and Performance Shortcuts?